Home World U.S. News How Beyoncé and Jay-Z got license to travel to Cuba? Two US lawmakers from Florida are demanding to know if the government sanctioned Beyoncé and Jay-Z’s vacation to Cuba. Ileana Ros-Lehtinen and Mario Diaz-Balart have contacted the Office of Foreign Assets Control at the Treasury Department, asking if Beyoncé and Jay-Z obtained the correct license to travel to Cuba. Angered by pictures showing Beyoncé and Jay-Z flaunting their retreat to the communist country, the legislators are criticizing the couple for indirectly supporting the oppressive regime of Raúl Castro by splashing as much as millions of dollars for luxurious accommodations for their entourage of family, friends and security. A report in The Caribbean Journal said the two members of Congress have written to the director of the US Office of Foreign Assets Control (OFAC). Ileana Ros-Lehtinen and Mario Diaz-Balart, who have openly criticized the repressive government in Cuba, are inquiring after the type of license Beyoncé and Jay-Z obtained to enter Cuba. “We would like to respectfully request, within all applicable rules and guidelines, information regarding the type of license that Beyoncé and Jay-Z received, for what purpose, and who approved such travel,” the lawmakers stated in their letter. “If these individuals were given people-to-people licenses, we would like to bring to your attention the Cuba Travel Advisory issued by OFAC on July 25, 2011 which states, <<OFAC only licenses People-to-People Groups that certify that all participants will have a full-time schedule of educational exchange activities that will result in meaningful interaction between the travelers and individuals in Cuba>>,” they added. Beyoncé and Jay-Z’s trip coincides with the news that a Cuban editor, Roberto Zurbano, was fired from his post at publishing house because of an article he wrote that claimed the country had a history of discriminating against blacks. Roberto Zurbano had mentioned the discrimination in an op-ed piece for the New York Times, For Blacks in Cuba, the Revolution Hasn’t Begun, published on March 23. On Friday, The Havana Times reported that Roberto Zurbano told his colleagues that he had been dismissed from the publishing house of the Casa de las Americas cultural center, in the wake of the article. Pictures showing Beyoncé and Jay-Z sauntering down a street in Havana, Cuba and taking in the island’s nightlife have sparked outrage among activists appalled that the couple could vacation in a country known for its oppressive regime. 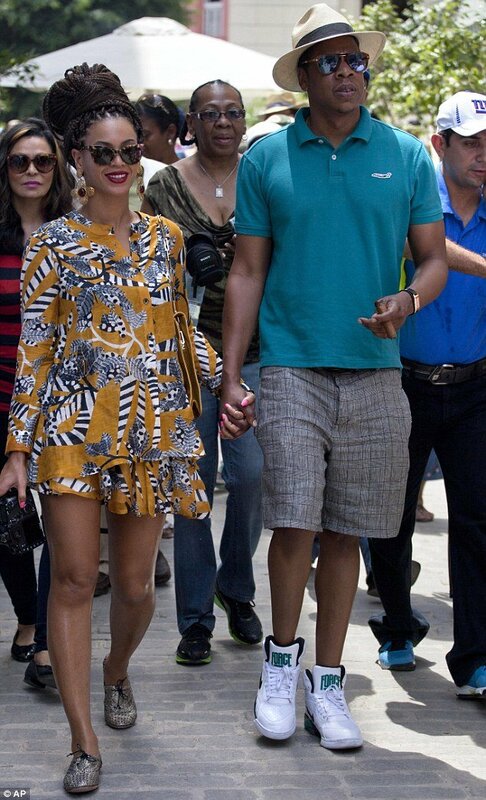 Beyoncé and Jay-Z took a jaunt to Cuba this week to celebrate their 5th wedding anniversary but many wonder why they decided on a place known for extreme poverty and repression of political dissidents. On Friday, the couple were pictured at the University of Arts in Havana and posed for pictures with students. It was not reported if Beyoncé and Jay-Z participated in any classes nor were details provided about the visit. Beyoncé, 31, even sang, though she was technically lip synching, the national anthem at Barack Obama’s 2013 inauguration and for his 2009 inauguration she sang while the president danced with First Lady Michelle Obama at a ball during the celebration. Since the jet-setters have politically tied themselves to the 44th president and could literally select any location in the world to travel, why would they decide on such a controversial destination? The US State Department classifies Cuba as “an authoritarian state that routinely employs repressive methods against internal dissent” and does not have diplomatic relations with the government, now lead by Fidel Castro’s brother Raúl. The vacation has left one human rights activist in a state of disbelief. “There are women getting beaten on a daily basis, women who are jailed for no reason…people are fighting for their freedom. It’s extremely insensitive,” Mauricio Claver-Carone, from the U.S.- Cuban Democracy Political Action Committee, told TMZ. Washington’s 51-year embargo makes it illegal for US citizens to visit Cuba for mere tourism, although tens of thousands of Americans travel there each year on academic, religious, journalistic or cultural exchange visas. The Obama administration eased many of the restrictions in 2011, but tourists still need a special visa to visit Cuba.